Jane is occupying her former council home as a political protest after she was evicted by Newham Labour council in March 2015. 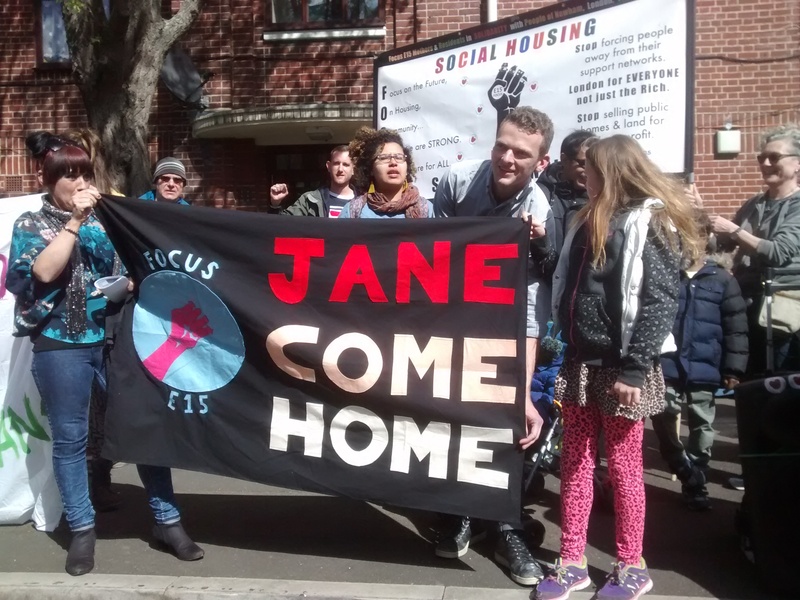 On Saturday 11th April, with full support from the Focus E15 campaign and many others, the doors of her former council flat were flung open and Jane threw a surprise house warming party. She was warmly welcomed back by her neighbours, family and friends. Jane was quick to hang up a newly made banner which states ‘Jane Come Home’ to the delight of her many well wishers and supporters who partied alongside her. Jane has a daughter who is 14 years old. They were both evicted from their home on the 24 March 2015 after being a tenant of Newham council for 20 years. Another victim of the government’s harsh benefit sanctions, she fell into rent arrears when her Employment Support Allowance was suddenly stopped and her housing benefit cut. She was evicted because she owes the council about 5 months rent of £2,569 (this figure includes some court costs). She missed the court date due to a combination of depression, illiteracy and fear. Help was in hand when her family offered to pay the full amount of rent owing but the council point blank refused the offer and said it was too late. On the day of the eviction Jane passed out with the stress and became another part of the tragic statistics for the amount of homeless families in Newham: almost 5,000 children are living in temporary accommodation. In the last two years alone, Newham has seen a 42 per cent increase in the amount of homeless familes, according to the figures analysed by Labour MP Dame Tessa Jowell and released from the Department for Communities and Local Government. This injustice has to stop.People need homes. The council should start to address these shocking statistics by giving Jane and her daughter their home back. After all, the amount or rent that is due is not much more than the monthly rent of one of the new luxury apartments that are mushrooming all over Stratford.We are asking the council to accept Jane’s family’s offer to pay the rent, clear the debt and allow Jane and her 14 year old daughter back into their home so that normal family life can resume. Jane’s daughter needs to attend her local school where she is due to sit her GCSEs. After 50 years since Ken Loach made the film Cathy Come Home, we are raising the issues of evictions and social cleansing in our community with the slogan Jane Come Home. Victory to Jane and all those who face the brutality of being ripped from their homes by council enforced bailiffs. Contact Jane’s Labour MP Lyn Brown to ask her to put pressure on the council for Jane to Come Home. Come to the next street stall on Saturday April 18th, on the Broadway outside Wilkos from 12pm-2pm in Stratford and then our open campaign meeting afterwards at the Carpenters Arms pub. Is “political protest” Newspeak for squatting? Does Focus E15 think squatting is doubleplusgood? Its crazy they won’t accept payment. Its the most likely way they will get the debt back, In fact there maybe legal room to take the council to court for not accepting. Time for the politicos to leave their comfortable Cotswold zone, to stop servicing international financial interests, and look after the needs of citizens.